Members of the Claremont McKenna Model U.N. team, from left to right: Dante Toppo '15, Nina Kamath '16, Aseem Chipalkatti '15, David Leathers '15, Aviv Caspi '16, Griffin Merians '17, Ellen Perfect '17, Pippa Straus '17 and Sumaer Sandhu '16. CMC MUN TEAM WINS INTERNATIONAL COMPETITION! Claremont McKenna's Model UN team recently competed in the the Harvard World Model United Nations (WorldMUN) conference, winning the conference in their size division. 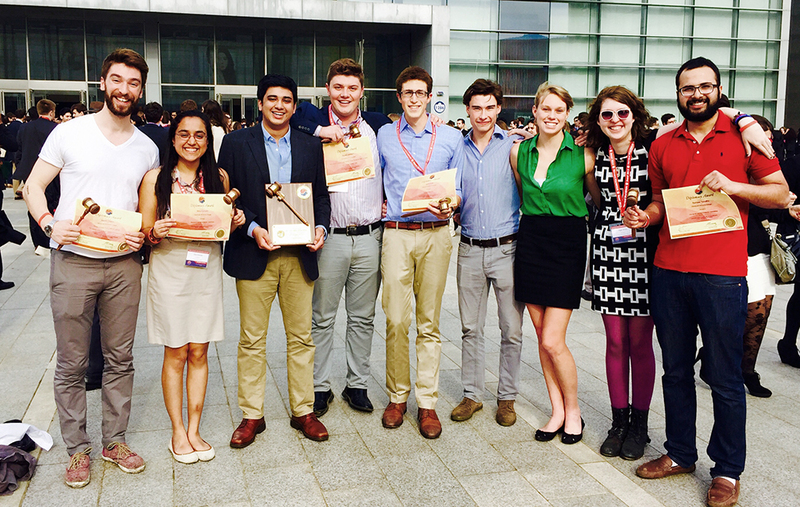 According to team president Aseem Chipalkatti '15, the WorldMUN, which took place March 16-20 in Seoul, South Korea, is billed as the "Olympics of MUN" and is very much the top-billed conference in the world. "This is a huge accomplishment," says Chipalkatti. "It involved beating out not only the country's top teams (many of whom compete at the conference), but also the world's top teams. In essence, we can effectively claim that CMC has a world champion Model UN team - which is nothing short of a little exciting for us! This is the second time in four years that we're World Champions." Chipalkatti, who wanted to thank the College and ASCMC for its support of the Model UN team, had this to say about the team's steep rise on the world stage: "We started from just about nothing four years ago - we were a non-ranked team that barely competed in conferences. By contrast, we are now an internationally renowned team that has global name recognition. " For the first time ever, CMC’s Model United Nations (MUN) Team took home top honors during Harvard’s National Model United Nations conference held Feb. 12-15 in Boston. In aggregate competition, CMC competed against college and university student teams from more than 60 countries. In the annual competition, MUN teams send individual members to compete as part of specialized committees, generally representing a single country. According to Aseem Chipalkatti ’15, President of CMC’s MUN and a competing team member since his freshman year, CMC represented Sierra Leone, and discussed matters ranging from Millennium Development Goals to global Journalistic Freedom and Protections. Competing teams are evaluated on their ability to lead discussion, provide valuable insight, and create compromise, with individual delegates evaluated on their ability to produce a workable solution to a presented question while protecting their own country's interest in a diplomatic and collaborative manner. “This is difficult, and a problem that world leaders struggle with as well, which makes us especially proud of all of the members of our team,” Chipalkatti said. Besides Chipalkatti who is a Philosophy, Politics, and Economics-Middle East Studies dual major, and Toppo, other members of CMC’s MUN team include; Phillip Pennell '16, Christina Straehle '16, Sam Minter '17, Pippa Straus '17, Griffin Merians ' 17, Naina Mullick '17 and Rose Agri '17. Chipalkatti partially attributes the MUN team’s success in competition to something ineffable that he calls a “CMC style” that is friendly and collaborative. Another big advantage for the CMC MUN team is the fact that the college produces a very strong selection of interdisciplinary-minded students. Although, admittedly it is rare to see a MUN delegate actually go on to work for the United Nations, the skills acquired in competition can judiciously apply to just about any work environment. Collaboration, friendliness, and initiative are valued in any workplace, and the MUN provides a space for CMC students to learn and practice those skills.